In the rush of the busy city life, many people often lose their mobile phones to theft or careless handling. Nowadays, it is easier to locate lost smartphones or even remotely ring, lock or wipe data from them. But most of the time, it is found that people usually don’t set up or use these features at the right time. Besides, these features are dependent on various factors, such as network availability, internet access, location settings, etc., of the smartphone. If any of these settings are not correctly configured, your phone won’t be able to broadcast its current location, and you won’t be able to access it remotely. Instead, if you lose your phone and are quite sure that you won’t get it back, there is another way you can try to locate it or block it with the help of the authorities. Every mobile phone has an International Mobile Station Equipment Identity (IMEI) number, which is used to identify valid devices. Thus, if your mobile phone gets stolen, you can call your network provider and ask them to blacklist the phone using its IMEI number. This would render the phone useless on your network and, in some cases, on other networks too. This method works for all mobile phones, smart as well as dumb ones. Sometimes, law enforcement agencies and cellular providers may also need the IMEI number to help you deal with the situation. For most mobile devices, IMEI number can be found out by dialling ‘*#06#’. But how do you find the IMEI number once your phone is lost or stolen? In this article, we’ll explore where to look for the IMEI number of your lost phone. The IMEI number for iPhone, Android or Windows Phone device may be easily found even after the device gets stolen. The following section will guide you to find the IMEI number for these smartphones. To get the IMEI number of your lost iPhone, you need to have at least one device backup available in iTunes on your computer. 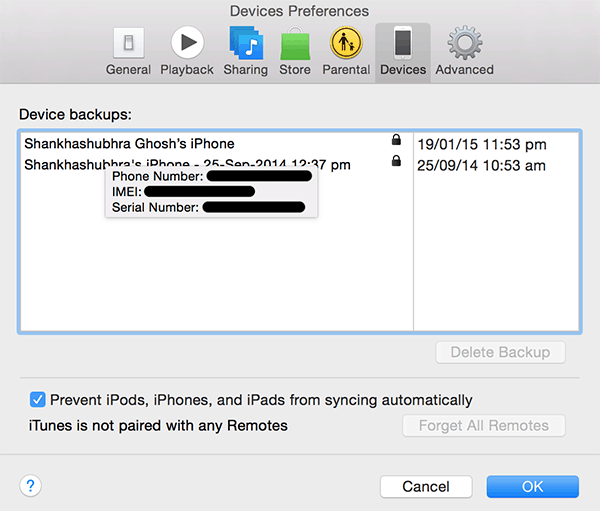 Follow the steps given below to find the IMEI number of your lost iPhone from an iTunes backup. Launch iTunes on the computer containing the backup. Go to iTunes Menu >> Preferences and select Devices tab. Your iPhone backups will be displayed under the Device Backups section. Hover the mouse pointer over any of the backups and wait for the details to appear. Your iPhone’s IMEI number will be present among other details in the tooltip message. Navigate to “google.com/settings” on your web browser and sign in to the Google account you used to register the lost device. Scroll down and select Dashboard under Account tools. You may be asked to re-enter your Google account password. In the Dashboard view, expand the Android section to find your registered Android devices. The IMEI number of the registered phone will be displayed along with other device details. If you have multiple Android devices registered under the same account, make sure you note the IMEI number of the correct (lost) device. Microsoft also stores information regarding registered Windows Phone devices and this information can be accessed by logging into your Microsoft Account. Follow the steps below to find out the IMEI number of your registered Windows Phone device in case it is lost. Login to “accounts.microsoft.com” and login with the Microsoft account used to register your lost Windows Phone device. Go to the Phones tab and select the particular device. Click on the link that says, “Find it, get support, and more…” adjacent to the device. Scroll down to the Support section. Here, under “Hardware/System Info”, you can find the current OS version and the IMEI number of the device. If your phone is lost or stolen, and it doesn’t run either of the three smartphone platforms mentioned above, your options to find the IMEI number are fairly limited. If you still retain the box in which your device came in, the IMEI number should be printed on the side of the box in barcode and text form. You may also find the IMEI number in the bill issued by the seller on purchase of the device. Once the IMEI number is found, call up your network provider and request them to block the stolen device using it. Once blacklisted, the device can’t be used to make calls on any cellular network, thus rendering it useless. Is there any other way to find out the IMEI number of a lost phone that we might have missed? Let us know in the comments below.